Currently the Universidad Nacional de la Patagonia San Juan Bosco operates a campus in Ushuaia with Faculties of Engineering, Economics and Humanities and Social Sciences. The City has another twelve institutions dedicated to secondary education. Four of these function as adult education and training centres. The Colegio Nacional de Ushuaia is considered Ushuaia's elite secondary school, modeled after the Colegio Nacional de Buenos Aires. Ushuaia has two television stations, channel 13 and channel 11, and two main newspapers: Diario del fin del mundo and Diario Prensa, plus several other minor publications. 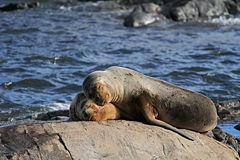 The climate is maritime subantarctic. Average temperatures coldest month: 1°C (33°F) and warmest month: 9°C (48°F). Record low -20°C (-4°F) (July), record high 31°C (87.8°F) (December) and record low ever recorded in summer -6°C (21°F) (February). Towns in the world with similar climate include Thorshavn, Faroe Islands; Dutch Harbor, Alaska; Reykjavik, Iceland; Stanley, Falkland Islands. Despite receiving only 560 mm (22 in) of precipitation yearly on average, Ushuaia's climate is very humid. On average the city experiences 160 days of rain or snow a year, with many cloudy and foggy days. The southwestern winds make the outer islands wetter, reaching 1,400 mm (55 in) at Isla de los Estados (Staten Island). Because temperatures are cool throughout the year, there is little evaporation. Snow is common in winter and regularly occurs throughout the year. Strong winds whip the town. Trees in Ushuaia tend to follow the wind direction, and are therefore called "flag-trees", for their uni-directional growth pattern. 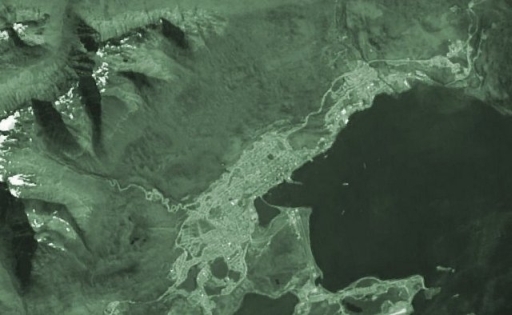 Satellite view of the city and its bay. 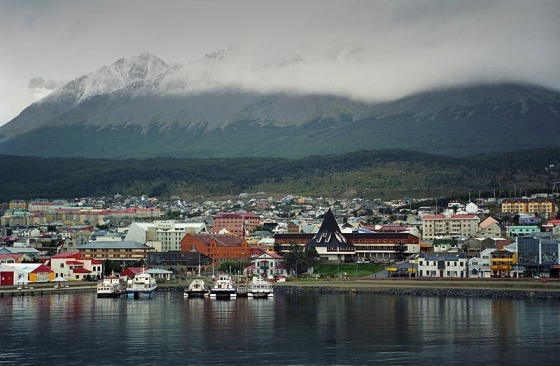 Ushuaia has long been described as the Southernmost City in the World. While there are settlements farther south, the only one of any notable size is Puerto Williams, Chile, a town of some 2000 residents that is not considered to be a city even by Chilean authorities. 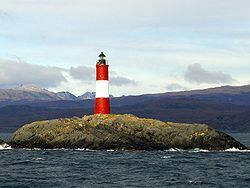 A 1998 article in the newspaper Clarín reported that the designation "Southernmost city in the world" was transferred to Puerto Williams by a joint committee from Argentina and Chile, but this information was denied by Argentine authorities, and there are no records of the committee resolutions. The Secretariat of Tourism of Argentina continues to use the slogan in official documentation and web sites. 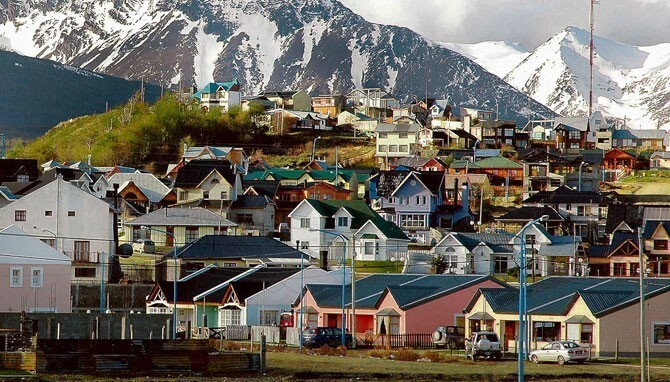 Ushuaia does qualify as a city, i.e., "an urban settlement of a particularly important status". It has a fully functional hospital, international airport, and primary and secondary schools as well as institutions of higher learning. Its 64,000 residents enjoy an organized public transportation system and a functioning municipality, and its industrial sector, led by the important Renacer Grundig electronics plant, is among the largest in Patagonia. 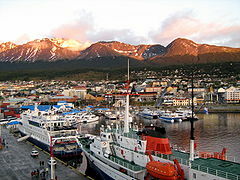 Ushuaia also serves as the provincial capital of Tierra del Fuego. The petty argument over the appellation "southernmost city" continues to hamper cooperation between Argentine and Chilean territory along the Beagle Channel. 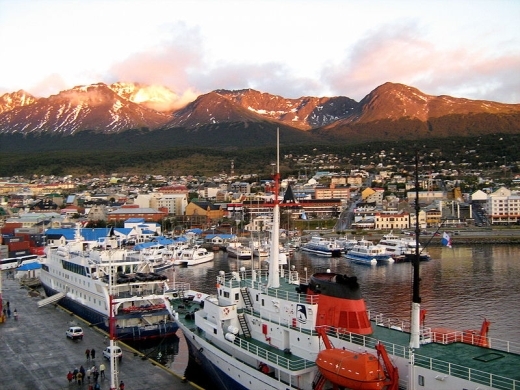 Ushuaia's short-sighted determination not to help promote the growth of Puerto Williams makes tourist access to the southern islands more difficult than necessary. Female sea lion and her pup. It is generally accepted that the Ona, also called the Selk’nam Indians, first arrived in Tierra del Fuego about 10,000 years ago. The southern group of the Selk’nam, the Yámana, occupied what is modern day Ushuaia, living in continual conflict with the northern inhabitants of the island. The British ship HMS Beagle under the command of Captain Robert FitzRoy first reached the channel on 29 January 1833 during its maiden voyage surveying Tierra del Fuego. The name Ushuaia first appears in letters and reports of the South American Missionary Society in England. The British missionary Waite Hockin Stirling became the first European to live in Ushuaia when he stayed with the Yámana people between the 18th of January and mid-September 1869. In 1870 more British missionaries arrived to establish a small settlement. The following year the first marriage was performed. During 1872, 36 baptisms and 7 marriages and the first European birth (Thomas Despard Bridges) in Tierra del Fuego were registered. During 1873, Juan and Clara Lawrence, the first Argentine citizens to visit Ushuaia, arrived to teach school. That same year, the Argentine President Julio Argentino Roca promoted the establishment of a penal colony for re-offenders, modeled after Tasmania, Australia. But only after the 1881 Argentina–Chile Border Treaty did formal efforts get under way to establish the township and its prison. The prison was formally announced in an Executive Order by Roca in 1896. On the 12th of October 1884, as part of the South Atlantic Expedition, Commodore Augusto Lasserre established the sub-division of Ushuaia, with the missionaries and naval officers signing the Act of Ceremony. Don Feliz M Paz was named Governor of Tierra del Fuego and in 1885 named Ushuaia as its capital. In 1885 the territory police was organized under Antonio A Romero with headquarters also in Ushuaia. But it was not until 1904 that the Federal Government of Argentina recognized Ushuaia as the capital of Tierra del Fuego. In 1896 the prison received its first inmates, mainly re-offenders and dangerous prisoners transferred from Buenos Aires but also at times political prisoners. A separate military prison opened in 1903 at the nearby Puerto Golondrina. The two prisons merged in 1910, and that combined complex still stands today. It operated until 1947, when President Juan Perón closed it by executive order in response to the many reports of abuse and unsafe practices. Most of the guards stayed in Ushuaia, while the prisoners were relocated to other jails farther north. After the prison ceased operation, it became a part of the Base Naval Ushuaia (Spanish), functioning as a storage and office facility until the early 1990s. Later it was converted into the current Museo Maritimo de Ushuaia.